Leaders are faced with unprecedented competition.Ãƒâ€š Business models can be made obsolete overnight.Ãƒâ€š Entire industries can be restructured by one deal. While some companies retrench and retreat, innovative companies are seizing the opportunities created by this turbulence. NeoSystems Corp., headquartered in Tysons Corner, VA, is a great example of a company who seized the moment to aggressively capitalize on new opportunities. The company started 12 years ago as a provider of accounting services for government contractors, who must comply with complex and burdensome rules. “Our vision is to be recognized as the innovator and pioneer in the field of strategic back office services,” explained Michael Tinsley, the CEO of NeoSystems. Over the past 18 months, NeoSystems has undertaken a strategic change initiative to bring everything (and everyone) into alignment with the new vision and strategy. To reinforce the concept of the New Neo, the company developed a new brand identity designed by Red Thinking.Ãƒâ€š The new brand projects a young, modern, high-technology vibe, with vibrant colors and an innovative logo mark. In addition, Neo created new core values, a new value proposition, a new tagline, a new organization structure, a new performance management system, a new dashboard, new job descriptions, a new website, new marketing collaterals, and more.Ãƒâ€š Each of these individual changes had an impact, but the cumulative effect of all of them together totally transformed the firm. 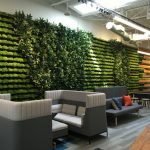 In early 2011, NeoSystems signed a lease for new, larger office space in preparation for their continued business success.Ãƒâ€š Thus, the company had the opportunity to reinforce the new strategy with the design of their new space. The space was designed by FOX Architects, and was built by Bognet Construction. The project manager was Cresa. The team did an outstanding job of using NeoSystems’ new brand identity to reinforce the strategic transformation.Ãƒâ€š The new logo and color palette were incorporated everywhere in very creative ways. The design of the new space was the exclamation point on the New Neo! NeoSystems unveiled the new space as part of their annual all-hands meeting in November 2011.Ãƒâ€š There was an incredible buzz about the design, the colors, the open floor plan, and the exceptional way that it reinforced the new strategy. The design features lots of open space, abundant glass, vibrant colors, and modern furniture.Ãƒâ€š It has a youthful, high-energy vibe.Ãƒâ€š Two kitchens serve as cultural anchors and meeting points. On Friday nights, people hang-out on the barstools for happy hour.Ãƒâ€š The NeoSystems logo mark is etched into glass panels along the feature wall, anchored by the company’s signature 322-gallon fish tank. Many of NeoSystems employees work on-site at their client’s location. Thus, hoteling was a key aspect of the design strategy. In addition, the space serves as a hub and home base for everyone. While every organization may not have the luxury of moving into new space, every leader would be well served to think creatively about how to use design to reinforce strategic and cultural priorities. It worked beautifully for NeoSystems.